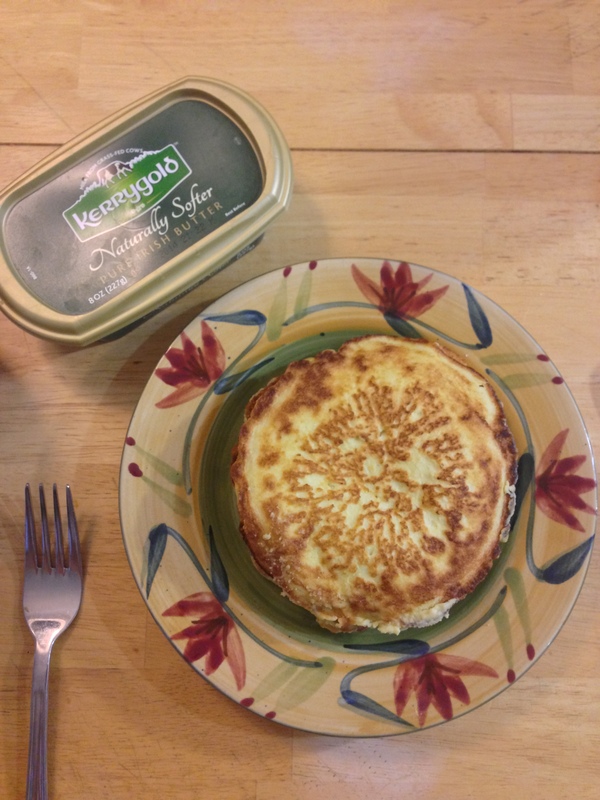 Pancakes in Your Loincloth | Gourmet B.C. One of my favorite things to eat is pancakes. And – this is totally terrible – I love the pancakes from IHOP. I know, I know. Just kill me now. They’re probably made with sugar and corn syrup, AND they probably make them out of underwear. There’s probably everything in their pancakes BUT pancakes. 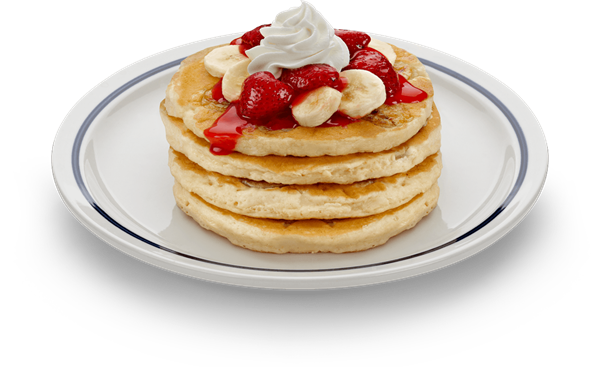 Strawberry Banana Pancakes from IHOP. Don’t these look perfectly amazing? Since going grain-free, I have found it really, really difficult to find a pancake recipe I like. My issue with them is they just don’t taste good. 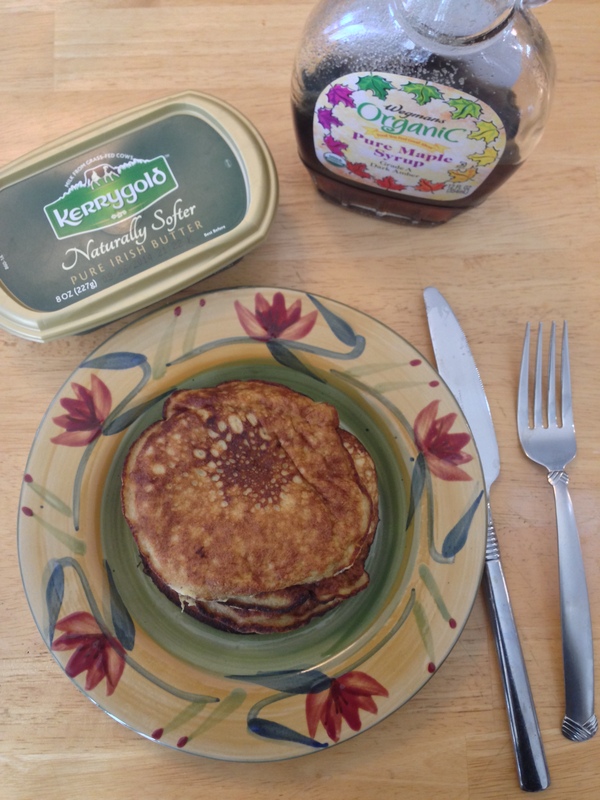 Most grain-free pancakes are made with almond flour (made from almonds). Sadly, this flour creates a horrible texture. Speaking of texture, I think this is the main issue with grain-free pancakes. 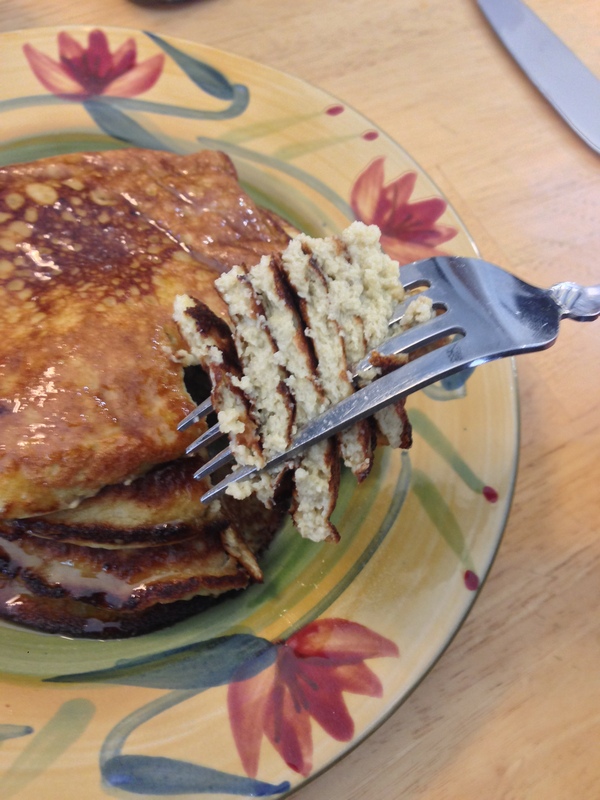 Everyone likes the smooth, chewy, melt-in-your-mouth aspect of the pancake, right? … Right? Yeah. So, this is odd, but grain-free pancakes are so grainy. When I bite into them, I feel like I’m biting on air bubbles and foam and gritty grains. It’s not pleasant. Is this fixable? I don’t know. Flour (gluten) gives pancakes that nice, smooth consistency. To make sure I wasn’t crazy, I tested some recipes. First up, a grain-free recipe that calls for coconut flour (made from coconuts). This isn’t almond flour, obviously, but I am still substituting a flour for a flour. What did I expect? First, I expected to be able to cut this recipe in half because I’m feeding one person, and it’s supposed to make 12 pancakes. The consistency was wrong when I halved it, so I just made the full batch. Um, okay. I’m not sure who this person is feeding, but I only got 6 pancakes using their measurements. Perhaps this person eats delicately, but I certainly do not. Second, I expected these pancakes to be fluffy. No, that did not happen. I was only half disappointed, though. I kind of knew that it wouldn’t happen, but I got my hopes up. Third, I expected them to be not grainy. They were indeed grainy. Considering I’m using a high rated coconut flour for this experiment, I’m going to assume that this happened because I’m using grain-free flour, and perhaps this happens with all grain-free flours (just as it did with my failed attempts at pancakes with almond flour). Fourth, I expected them to taste good. They didn’t, but this may be partly my fault. I cooked them in coconut oil, and I think I should have cooked them in butter. Regardless, they were quite bland and flavorless. I’m not 100% sold on the fact that butter could have fixed this issue. And so another disappointed road to pancakes. The next day, undeterred by my previous day’s failure, I decided to try to make simple pancakes. A friend had told me about 2-ingredient pancakes. “YES way! They’re supposed to taste good, too!” she informed me. Yeah right, I thought. You’re so gullible, but not me! Super simple, right?! I didn’t like the consistency, though. It wasn’t thick enough for pancakes. What is gelatin? To answer this question, let’s go back to say, the Paleolithic days. There you are, roaming the forest in your loincloth, spear ready to strike any animal you see because you and your family haven’t eaten any meat for weeks. You see a lion (in the forest?). You throw your spear! It dodges, comes racing at you. You manage to wrestle the lion down with your bare hands, proving you are the ultimate warrior. Now, what do you do with that lion? Do you gingerly cut it up, throw away the skin and bones and just eat the good parts of the meat like we would today? You use the skin for clothes or blankets. You cook and eat every part of the meat because who knows when you’ll be able to kill another animal again. You boil the bones in some water you find. You eat the fat to keep you sustained. You eat every part of the animal. To this 1 banana, 3 egg batter, I added 1 tablespoon of gelling gelatin (the one in the red can makes it gel, like Jell-O), to give it a better consistency for pancakes. It didn’t really work. The pancakes were rather flat and still pretty tasteless despite the delicious banana in them. I’ll keep looking for that perfect grain-free pancake. 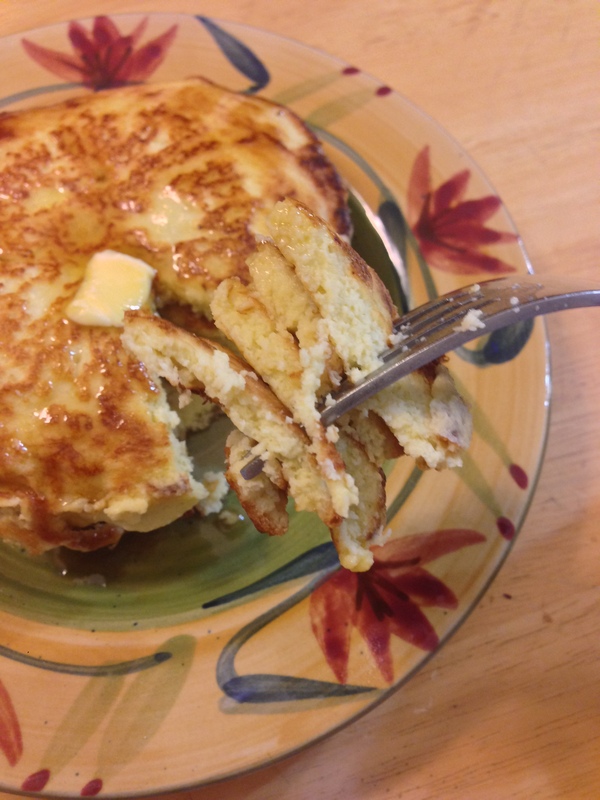 This entry was posted in Recipe Review and tagged 2-ingredient pancakes, bananas, butter, coconut flour, coconut oil, eggs, gelatin, grain-free, ihop, lion, loincloth, paleo, pancakes, storytime by Brittany W. Bookmark the permalink. Ummm welllll I should be. Gluten doesn’t destroy me, but it does icky stuff to my sinuses and if I eat it too often, I notice that I get physically drained. I’ve switched to baking with spelt flour because that doesn’t affect me as much (and has less gluten in it). But those sound good! Please let me know!